i am a huge pasta lover. whenever we go to a restaurant my husband will order steak or some other meaty main dish and i will always, always, and forever order pasta as mine. i think you can always identify a pasta person by their pantry – if they’ve got 83 or more packages of pasta at any given time, you know this person eats pasta at least 3-4 times a week. and by my definition – that is a pasta lover. i’ve always got spaghetti, fettuccine (to go with this amazingly creamy alfredo sauce), shells, bowtie, and other assorted random shapes of pasta in my pantry. 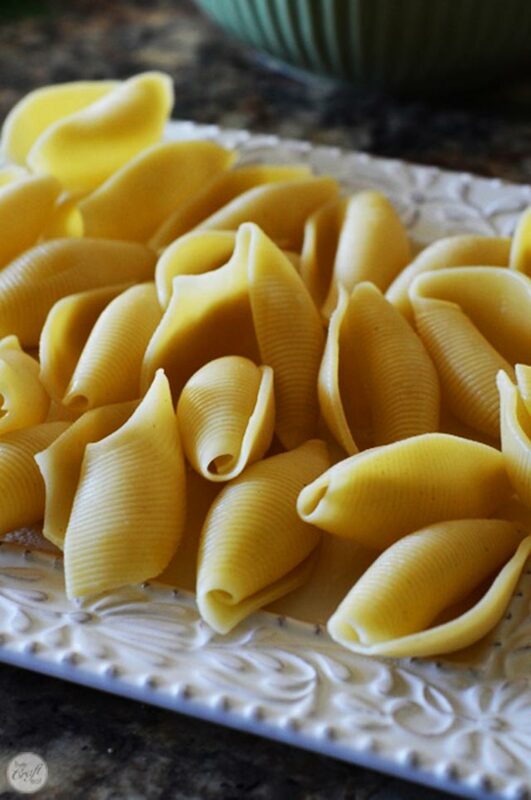 but my favorite to have on hand these days are jumbo pasta shells – the kind that fit nicely in the palm of your hand. 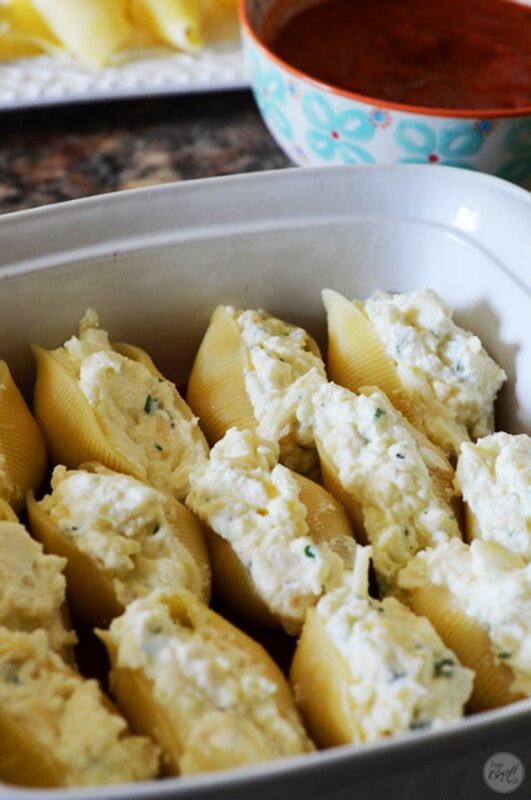 and this three-cheese stuffed pasta shells recipe is the reason why. 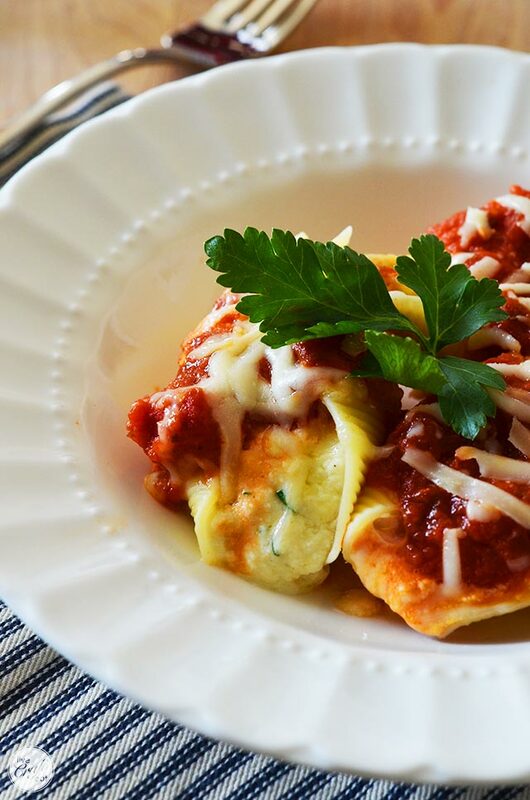 they are just a jumbo-sized pasta shell filled with a delicious concoction of ricotta cheese, parmesan cheese, mozzarella cheese (hence the three-cheese name), and a couple other simple ingredients, topped with jarred marinara sauce…and more cheese. this is a no-meat main dish, so vegetarians can love this too. let me show you how simple it is to put together. while those pasta shells are doing their thing, let’s get the filling ready. 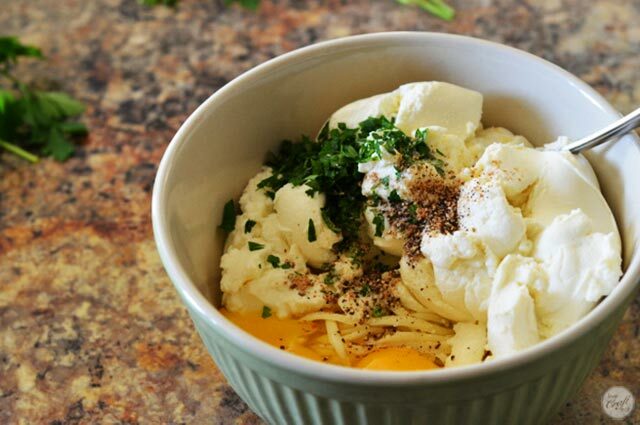 in a medium bowl, combine the three cheeses (ricotta, mozzarella, and parmesan) along with a couple of eggs (to help bind everything together), some fresh parsley, salt, pepper, and nutmeg. simple, right? 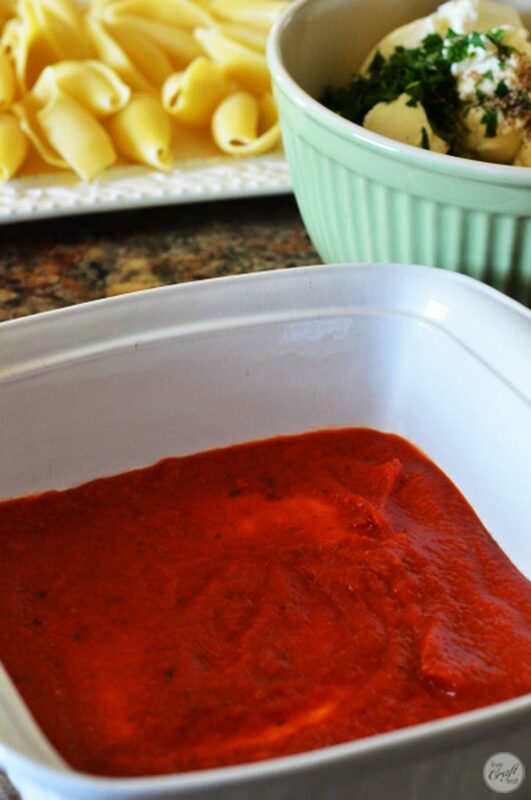 after you’ve got the filling all combined and ready to go, spread a layer of your favorite jarred marinara sauce (also in every pasta lover’s pantry), on the bottom of a pan. in a 9×9 pan, you’ll get about 15 shells, and in a 9×13 pan, you’ll get about 21 or so to fit. if you need to, you can do a second layer. just so you know. by this time the pasta should be about done. make sure to drain it and spread them out in a single layer so they don’t stick together. then just grab a spoon with some filling in one hand, and use your other hand so hold open a single shell and stuff it full of the cheesy goodness. place each one on top of the marinara sauce in your pan, snuggling them nice and close. 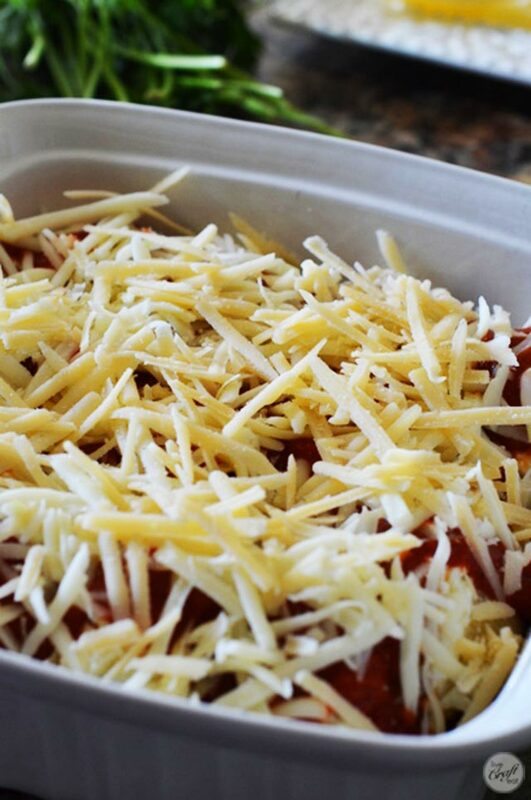 …cover it with tinfoil and bake at 375 for 35 minutes until the cheese on top is nice and melty and bubbly. the sauce will have coated the pasta and the cheeses are now gooey and delicious…oh man, my mouth is watering just thinking about it. use a large serving spoon to serve a few shells to each person alongside some crusty bread and/or a yummy salad. ok, i’m making this again next week. i can’t handle it, it is sooo good!! it’s a pasta lovers dream come true. you need to print off this recipe, or at the very least write down the ingredients on a scratch piece of paper and get to the store asap. i have a feeling, whether you’re a huge pasta fanatic like me or not, that you’re going to love this. cook pasta for only 10 minutes. drain and lay out to cool slightly. 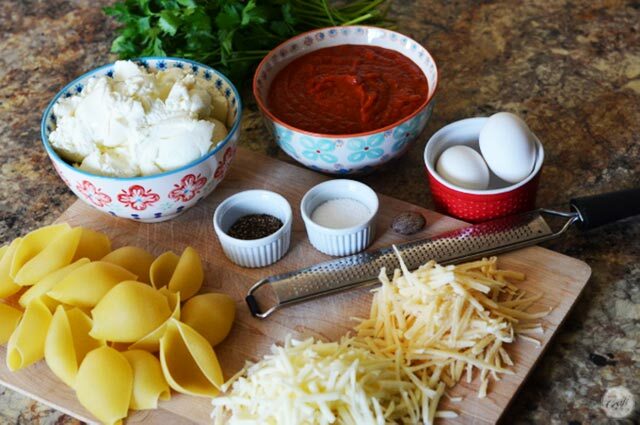 in a medium bowl, combine the cheeses (ricotta, mozzarella, parmesan), eggs, parsley, salt, pepper, and nutmeg. spread ½ cup of marinara sauce on the bottom of a pan. 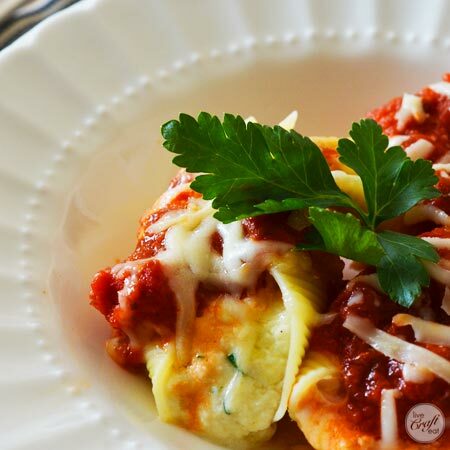 fill each pasta shell with about 2 tablespoons of the cheese filling and layer them in the pan, making two layers, if needed. 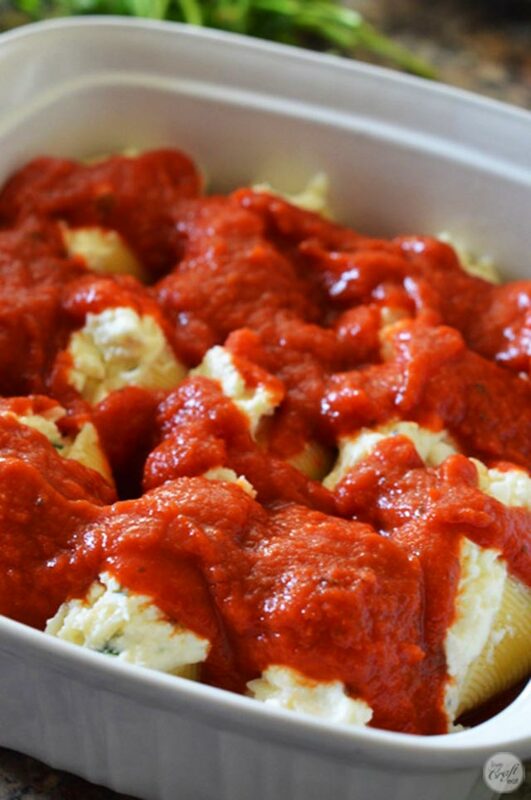 spread remaining marinara sauce over the top of the shells and sprinkle with mozzarella and parmesan cheeses. cover with foil and bake at 375 for 35 minutes. 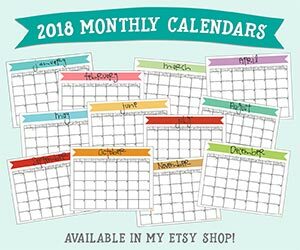 Can I freeze this easy three cheese stuffed shell recipe once assembled? Absolutely!! I do it all the time! Just freeze it once assembled (do not bake it first). Defrost it in the fridge overnight, or bake it for about twice as long as the recipe calls for if you’re baking from frozen!